Style 20 — A medium weight and rough texture linen, at 12.4 oz per square yard (primed), it is ideal for landscape painting and impasto. 73 TPI. Style 15DP — A medium weight linen with a medium texture, Style 15DP is double primed, and weighs approximately 14.7 oz per square yard with the primer applied. 80 TPI. Style 12 — Claessens’ heavier portrait grade linen, at 11.3 oz per square yard (primed), has a fine texture and smooth surface. Use it for larger works that require more support. 91 TPI. 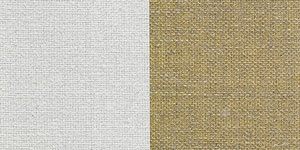 Style 13 — Claessens’ lighter portrait grade linen, at 9.6 oz per square yard (primed), has a fine texture and smooth surface. Use it for smaller portraits and other richly detailed works. 117 TPI. 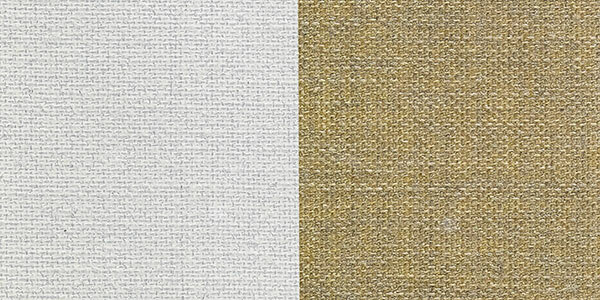 Style 29 — Claessens’ rough texture heavyweight linen, at 16 oz per square yard (primed), is perfect for large-scale works that support a heavy paint layer, such as impasto. 87 TPI. Style 9 — Medium threads and medium weight, but finished with a very smooth surface. Although the weave and weight is similar to Styles 15 and 20, the finish is much smoother, ideal for painting detailed works in larger formats than would be suitable for a portrait grade linen. Claessens oil primed linen canvas is sized with synthetic glue to protect the fabric from acidic oils, and to lend rigidity to the canvas for ease of stretching. Next, it is primed with Zinc White pigment bound with linseed oil and placed into a drying room for three days to air-dry naturally. Then the canvas is sanded and a coating layer of Titanium White is applied. Finally, the canvas is placed into a drying room for an additional 10 days until it is completely dry.